Dr. Felipe Chibante sits in his office and lab space at the University of New Brunswick with impressive credentials behind him. In addition to holding the Dr. Richard J. Currie Chair in Nanotechnology, receiving the NBIF R3 Innovation Award of Excellence and other numerous awards for his work, Chibante earned his PhD at Rice University in Houston under the tutelage of the late Professor Richard Smalley, the ‘father of nanotechnology’ who won the Nobel Prize in Chemistry in 1996 for his work in producing Carbon 60. 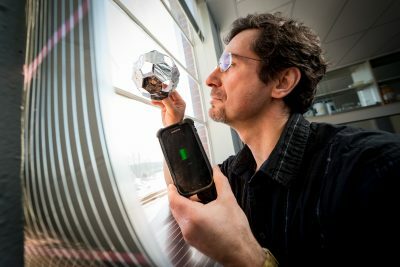 Carbon 60, the soccer ball-shaped molecule that Professor Smalley discovered in Houston, was the first fullerene (a new man-made carbon molecule unlike those already known such as graphite and diamond) to be discovered. Smalley and his students, including Chibante, manipulated carbon atoms for the first time; by changing the way atoms came together they were able to create something completely different. Carbon 60 is prized for its optical, electrical and thermal characteristics, and is used in everything from engine treatments to sensors to cosmetics. 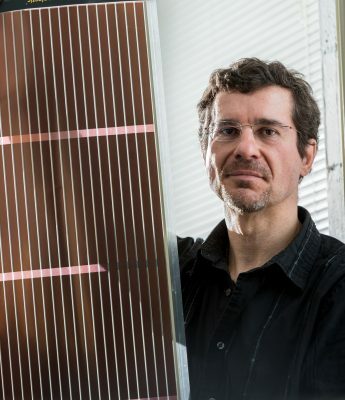 The work Chibante did with Professor Smalley to produce Carbon 60 in larger quantities set the course for his life: to solve the world’s energy crisis through nano-enabled clean energy. With most of his focus on Carbon 60, one of the first problems he tackled was getting the extremely expensive cost of producing it down to a reasonable level. So he and his team, including research associates, grad students, and post-doctoral students, recently completed a project funded by a federal Atlantic Innovation Fund and the New Brunswick Innovation Foundation to scale a new process. They built a device that creates a reaction that reaches a temperature of approximately 5,000 degrees Celsius, approaching the sun's surface temperature. By creating this energy more efficiently and affordably - and with less pollution - he predicts a significant price drop. Chibante believes that the flexible, thin-film, carbon-based solar cells now created could have expanded applications, from creating photovoltaic threads you can wear to power your tech to prosthetic gloves that better measure pressure. His main interest now, however, is to apply the technology to what he sees as the world’s biggest need: clean energy. The nano guru wants to pick up the baton from Professor Smalley to solve the problem of supplying the world with enough energy - without compromising the planet – using nanotech. “Almost all of our problems stem from energy: food supply, pollution, water…if we can solve our energy problem with carbon nanotechnology, we can save the world," he excitedly exclaims.